Plot is taken from the movie One Flew Over The Cuckoo's Nest. Also it has resemblance to old hindi movie Khomoshi. It is also Priyadarshan's adaptation of his own previous Malayalam film Thalavattam (1986). Salman, a mad man who kill his girl friend Rimi and is sent to the metal house. In there there is a lady doctor Kareena who helps him to get better and falls in love with Salman, but she has a fiancé Sunil. 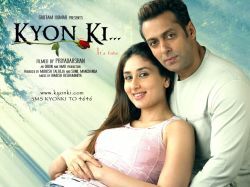 There are twists and turns and in the end Salman dies and Kareena becomes mental.